The entrance to Chesterfield's new park. College Meadows Park offers 10 exercise stations similar to this one. Tom McCarthy oversees all parks operations for the City of Chesterfield. Nancy Gomer is Marketing Coordinator for the St. Charles County Department of Parks and Recreation. As the weather gets warmer this month, St. Louis gains two more places to enjoy springtime outdoors. St. Charles County is cutting the ribbon of a new park on Monday, while St. Louis County debuted a new park last week. The larger of the two parks, named River’s Edge, covers 188 acres in Chesterfield near the Taubman Prestige Outlets. It has a lake much larger than Chesterfield’s others parks and it connects to the Levee-Monarch Trail on the Great Rivers Greenway. These features offer west St. Louis County residents a new place to bike, hike and fish. Lakefront at River's Edge Park. Tom McCarthy is Parks, Recreation and Arts Director for Chesterfield. He said that the city wants to make the park’s lake a destination for water recreation like kayaking, canoeing and paddle boating. These activities are unavailable at other nearby parks. “It will bring another opportunity for the residents and friends and guests of Chesterfield to get outside and just be active and be healthy and, hopefully, give that quality experience of people out in the outdoors and getting away from the TV,” McCarthy said. He hopes that the park will provide many people with an opportunity to have fun with nature. The park will eventually offer bird walks and flower identification program. "Plus it's just a nice, passive park where people can get away from the hustle and bustle and be out there with nature close to town," McCarthy said. The park’s grand opening was on April 11. An event from 11:00 a.m. to 2:00 p.m. celebrated Arbor Day and gave residents a taste of the nature activities the park provides. River’s Edge is part of Chesterfield’s Parks Master Plan to provide local communities with the green space and trails. A Municipal Parks Grant through St. Louis County provided $272,000 to create the park and the city put in another $25,384. St. Charles County, meanwhile, is cutting the ribbon on a different sort of park this Monday. While River’s Edge offers water activities and nature trails, College Meadows Park offers disc golf and a wheelchair-friendly fitness trail. College Meadows Park is a collaboration between St. Charles Community College and the county’s parks department. 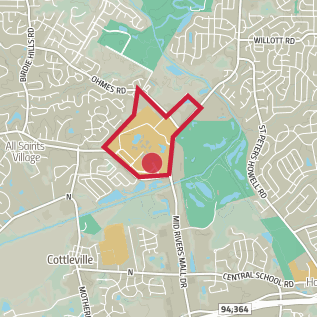 It’s located on 80 acres that were formerly undeveloped on the Cottleville college campus. It will stay there for at least the next 20 years. After that, it’s up to the college to extend the park’s lease. Otherwise, the park’s amenities will be packed up and moved to a new location. College Meadows Park's wheel-chair accessible fitness machine. These amenities include a fitness trail with 10 exercise stations and a machine built to help disabled individuals exercise from their wheelchairs. The park sits at a central area in the community, and uses the fitness trail to connect to nearby schools, greenways, other parks and the campus walkway. Nancy Gomer, Marketing Coordinator for St. Charles County Parks, said that these features will make the park accessible to residents of all ages and mobility levels. Gomer said she believes that the park increases the community’s access to unique natural recreation. “We vowed 18 years ago during our conception that we would not duplicate the services of municipal parks. So this is something different that municipal parks don’t have,” Gomer said. Both cities' parks departments have plans to continue developing parks that offer recreation, green spaces and natural fun to communities. 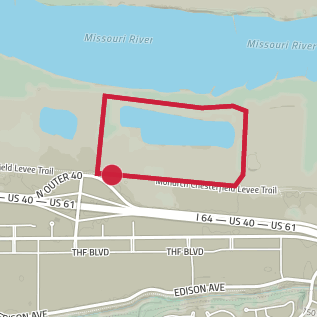 Approximate location of River's Edge Park. The gravel trail entrance is located in the northwest corner of the Taubman Prestige Outlets parking lot. Approximate location of College Meadows Park. The trails connect in many places in the local area. Chesterfield received plenty of attention recently when it snagged two high-profile festivals away from the city of St. Louis. But the hubbub over the Taste of St. Louis and Bluesweek’s exodus may be part of a larger story.